Report of the October Meeting. Program for the November meeting and December event. 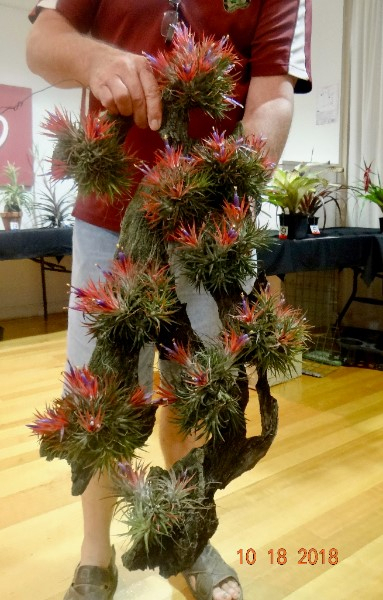 The main meeting theme was My Favourite Bromeliad, facilitated by Bruce Dunstan. Results of October Mini Show. President Barry Kable welcomed guests. The Christmas party on 6th December features a monster raffle with over $2200 worth of plants to win. Barry thanked Mickey Farrell for sorting through 800 names of people contacted at the RNA Show. My Favorite Bromeliad was the theme of the meeting hosted by Bruce Dunstan. 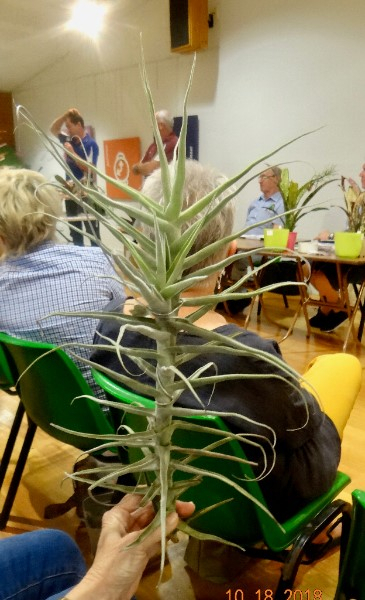 Members and visitors were invited to bring their favourite bromeliad from their garden. 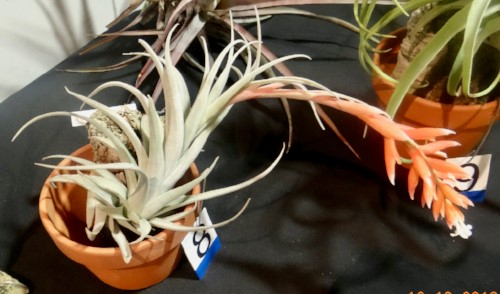 Tillandsia copanensis from Bruce Dunstan. He says this is the first time he has flowered it. This took 5 years of growth from a pup, and has needed longer hanging wires over time. He plans to use it for making hybrids. There are clones of this species. It is a rare species from Honduras. 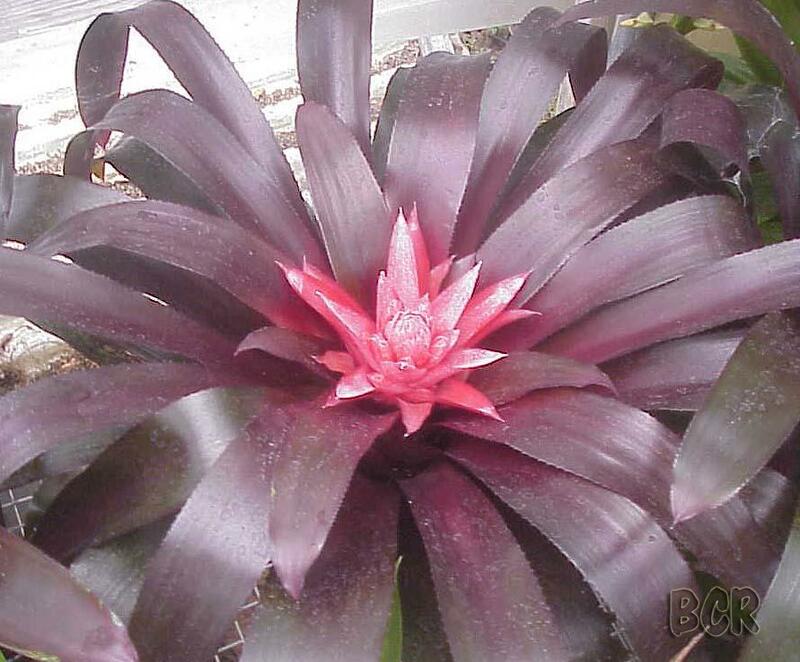 T Tricolor is also a favourite because the plants came from Olwen Ferris, a pioneer bromeliad grower in Brisbane. Nev Ryan got his first plant from her when she came to the Gold Coast in 1974. 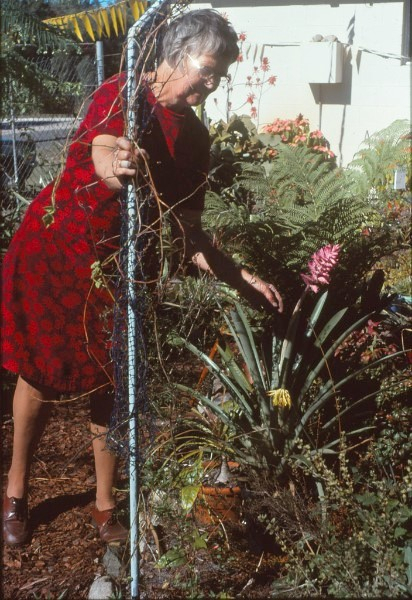 Olwen Ferris seen in her garden in 1980. Tillandsia duratii/streptocarpa? from Bruce Dunstan. Hechtia tillandsioides from Barry Kable. It is mostly spineless and comes in separate male and female plants, and comes from Mexico. Canistrum triangulare from Margaret Kraa. She likes the compact rosette and maximises light to bring out the colour. Denise Ball is a hybrid of ‘Estrella’ x ‘Hallelujah’ by Russell Holzheimer. Neoregelia johannis ‘De Rolf’ from Coleen Smith. Neo johannis is a species, and De Rolf is the variegated cultivar. 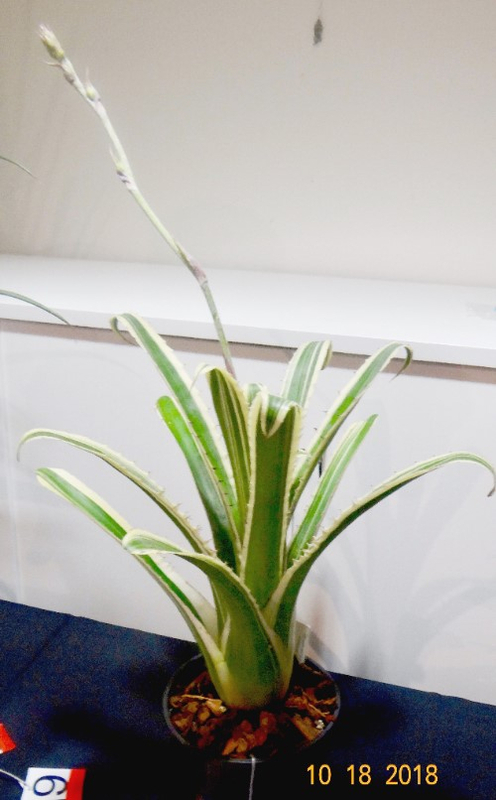 This large bromeliad can grow 1m across, can tolerate full sun, and grows variegated offsets. Tillandsia ionantha was brought in by Greg Aizlewood, beautifully grown on a piece of wood for about 10 years. Tillandsia usneoides clump from Denice McLean came from Collectors Corner in 2016 via Bernard Holm. It thrives on monthly liquid fertiliser. Bruce emphasised the need for good air circulation for this one to thrive. Tillandsia ionantha ‘Fuego’ ball from Greg Aizlewood is grown in full sun all winter, but partial shade in the summer. Tillandsia mallemontii x crocata from Steve Molnar emitted a delicate aroma from its many blooms. Cryptanthus ‘It’ from Barry Kable who grows this in a semi hydroponic medium. He used clay balls, but could have used marbles. 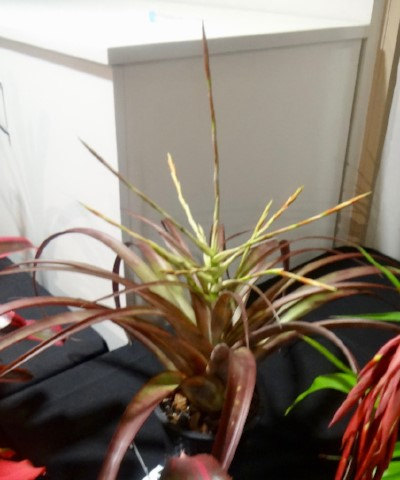 It is a marginated mutation of Cryptanthus arelii. There seemed general agreement that this was a successful new format, to be repeated. Bruce Dunstan did a great job facilitating the group activity. The committee is looking to expand. If you are interested in joining the committee, please email us. The BSQ Christmas Party will be a buffet dinner with a Monster Raffle. Location: Easts Leagues Club, 40 Main Avenue Coorparoo QLD 4151. RSVP: Please make payment by Thursday 15 November 2018 (date of the November meeting). 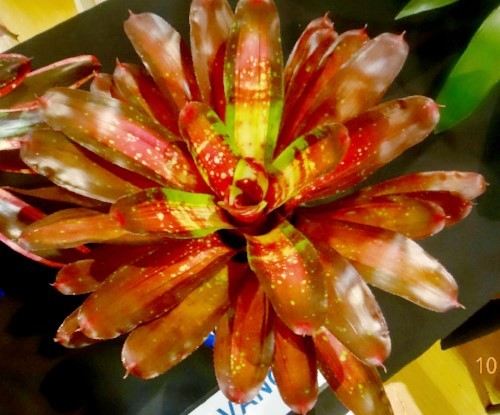 1st Neoregelia hybrid by Gilda Trudu. 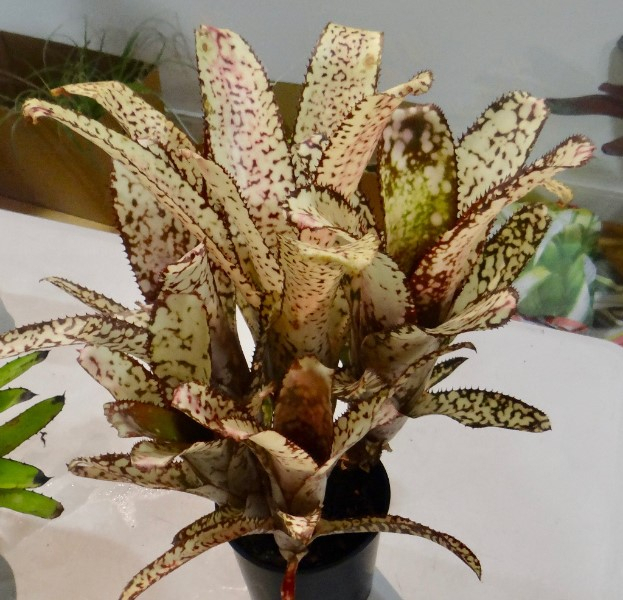 2nd Neoregelia hybrid by Alfonso Trudu. 3rd Neoregelia ‘Red Macaw’ by Phillip Jack. 1st Till fuchsia var gracilis by Gilda Trudu. 2nd Till filifolia by Alfonso Trudu. 3rd Till ‘Beauty’ by Gilda Trudu. 1st Deuterocohnia By Gilda Trudu. 2nd Deuterocohnia brevifolia by Gilda Trudu. 3rd Puya mirabilis by Alfonso Trudu. 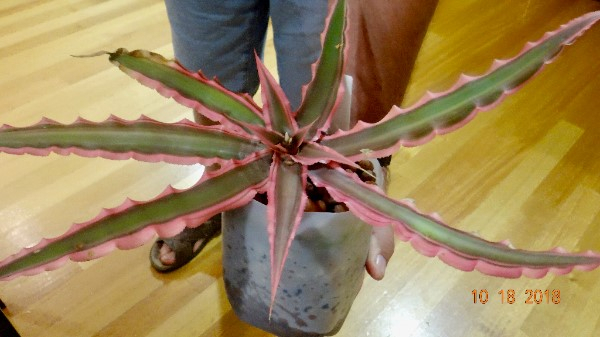 1st Cryptanthus ‘Pink Starlight’ by Phillip Jack. 1st Neoregelia ‘Princess Grace’ by Fred Thomson. 2nd Neoregelia ‘Lady Leonie’ by Jenny Ittensohn. 3rd Neoregelia ‘Catherine Cathcart’ by Fred Thomson. 1st Tillandsia flabellata by Fred Thomson. 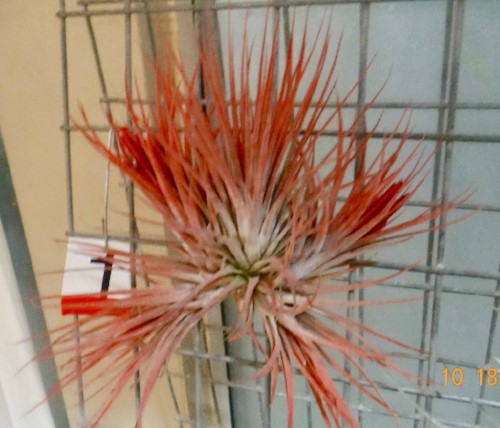 2nd Tillandsia ‘Bak’s Noddy’ by Fred Thomson. 3rd Tillandsia utriculata by Livia Doidge. 3rd Tillandsia ‘Curra’ by Livia Doidge. 1st Hohenbergia ‘Karla’ by Fred Thomson. 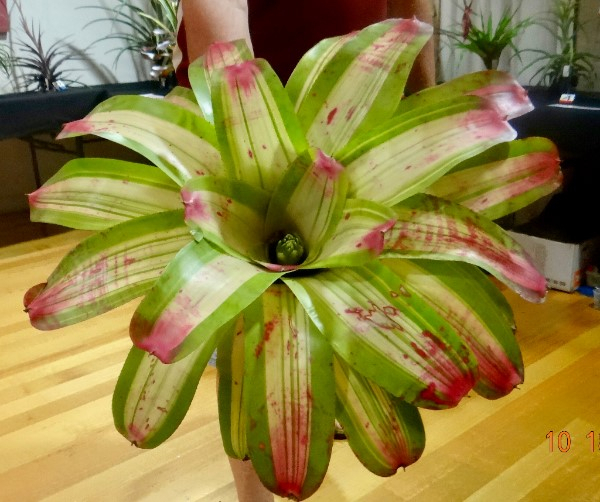 1st Neoregelia ‘Burnsies Spiral’ by Barb McCune. 2nd Neoregelia ‘Garnish’ by Barbara McCune. 3rd Neoregelia ‘Gold Medal’ by Barbara McCune. 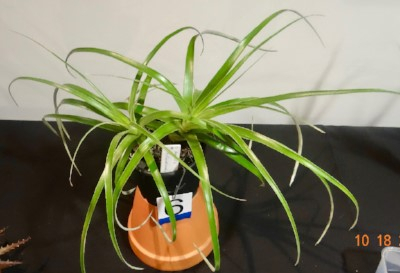 1st Tillandsia copanensis by Bruce Dunstan. 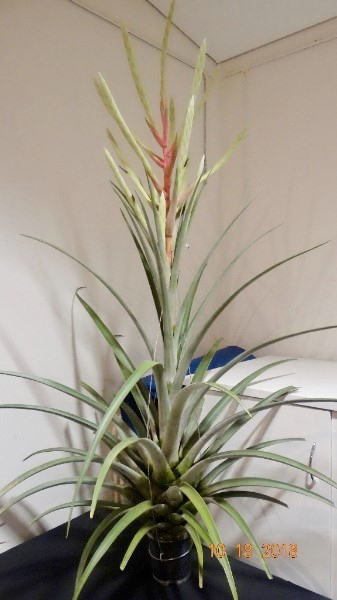 2nd Tillandsia recurvifolia var subsecundifolia by Ron Jell. 3rd Tillandsia streptophylla by Ron Jell. 1st Hechtia tillandsioides by Ron Jell. 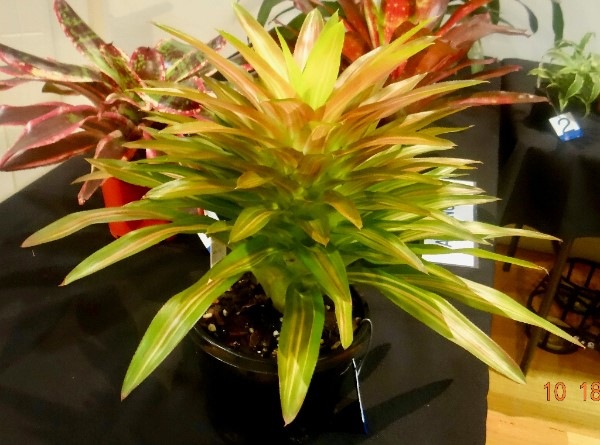 1st Guzmania ‘Focus’ by Barbara McCune. 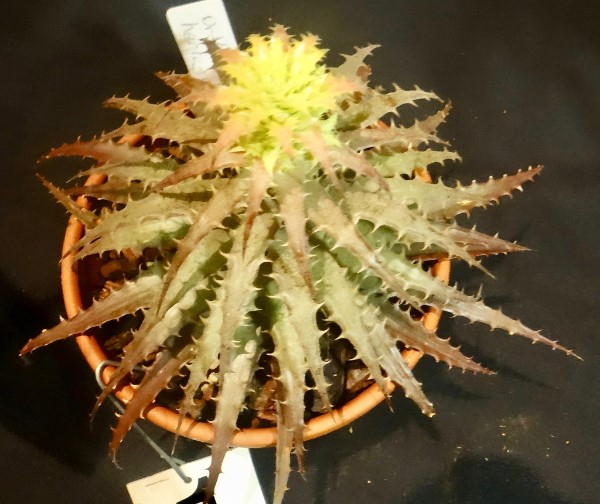 2nd Cryptanthus acaulis variegata by Barbara McCune. 3rd Orthophytum harleyii by Barbara McCune. Neoregelia 'Burnsies Spiral' from Barbara McCune. Neorgelia 'Gold Medal' from Barbara McCune. 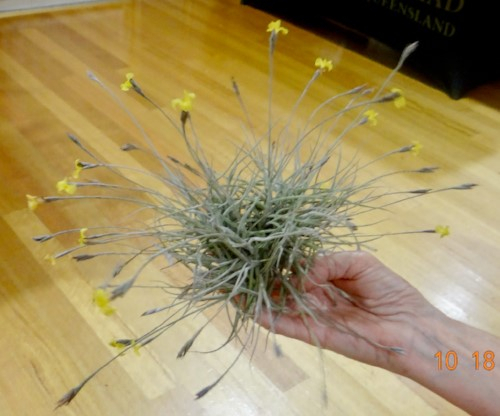 Tillandsia copanensis from Bruce Dunstan. Tillandsia recurvifolia var subsecundifolia from Ron Jell. Orthophytum harleyii from Barbara McCune. Hohenbergia 'Karla' from Fred Thomson. Tillandsia 'Curra' from Livia Doidge. 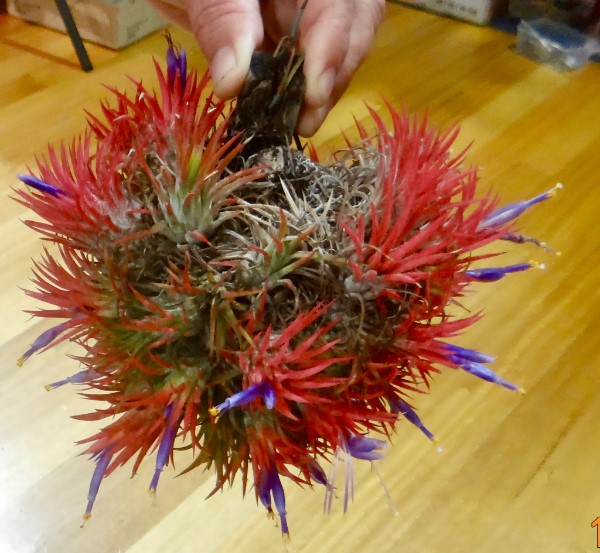 Tillandsia flabellata from Fred Thomson. Tillandsia 'Bak's Noddy' from Fred Thomson. 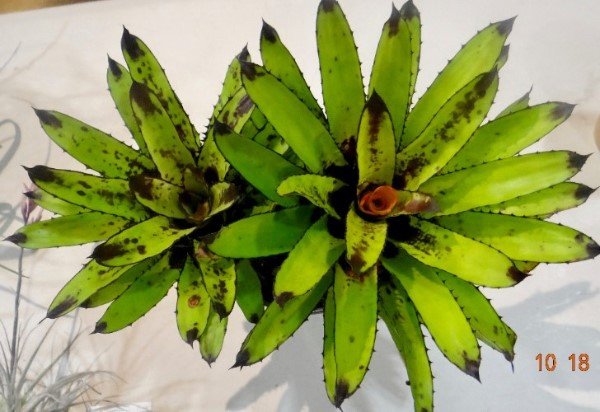 The Australasian Bromeliad Conference will be held at the Gold Coast on 17-20 October 2019. Seed Raising with Barry Kable and Tom Isaac. 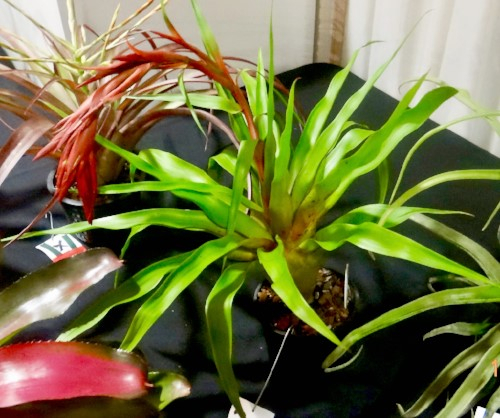 Neoregelia and Nidularium with Pam Butler and Barry Kable. Amanda Meads on 'Making A Green Wall Display'.